This season, take your skin care cues from your dinner table! These products feature the Thanksgiving staple, pumpkin, to ensure your skin looks its best this season. Pumpkin is an excellent source of Vitamins C and A to protect, heal and stimulate collagen production, and Zinc Oxide, which is a powerful anti-inflammatory and aids in skin repair. Pumpkin is also packed with enzymes that naturally dissolve dull, dead skin for a glowing complexion. This creamy cleanser contains pumpkin and honey enzymes, to gently exfoliate and hydrate while cleansing. It completely dissolves dirt, oil and makeup, leaving skin soft and smooth. Perfect for all skin types! 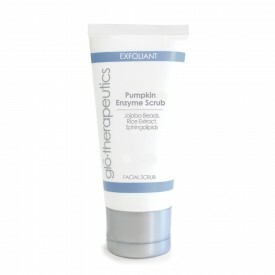 This scrub combines gentle jojoba beads with pumpkin and fruit enzymes for both physical and chemical exfoliation. It also contains powerful anti-inflammatories to ensure your skin never gets irritated. Use 2 to 3 times a week for a glowing complexion! This mask from my beloved Sanitas line combines pumpkin enzymes with hydrating hyaluronic acid and squalane to gently exfoliate while hydrating. Right after using this mask, you'll see smooth, soft skin with a decrease in fine lines and discoloration. Or... you can create your very own mask at home! Combine the following ingredients, apply to face and rinse off after 10 minutes. I just love the scent of pumpkin products! They are so soothing and comforting. What are your favorite holiday scents or products? Pumpkin is also packed with venapro enzymes that naturally dissolve dull, dead skin for a glowing complexion.